How Do You Plan Something Like That? Another question that we have been asked is how we are going to plan such a big trip. It can seem daunting, but it has also proved to be pretty fun because we are so excited! The first thing we had to decide was what we were most excited to see. We both had some ideas about what we wanted to see around the world such as: The Parthenon, other ancient world ruins in Greece and/or Turkey, Machu Picchu, the Amazon, the most southern points in the world, Penguins, Pyramids, the Taj Mahal, the Himalayas, castles in Europe, The Great Wall of China, Angkor Wat, etc. We both love ruins, history, and outdoor beauty. Della was interested in visiting some of the countries from which her students come from: Burma and Nepal. After thinking about the highlights we wanted to see, we had a huge list! So we had to pare it down a bit. We first took into account that some places are easier to get to from the US than others. For example, we ultimately decided not to visit South America during this trip at all because it is so much easier to reach than all the other continents. We believe that we can fly to many countries in Central or South America for shorter vacations in our future. It is easier to plan a two week summer vacation when you are only a couple of hours away via plane. It is much harder to plan that same vacation when you know you will be spending over a day’s travel time on each end (plus jet lag). This thinking led us to focusing on Africa, Europe, and Asia on this trip. Next, we tried to see how we could make them fit together in some semblance of order. We did not want to flit all over the world in big plane rides – we’d rather want to travel overland where we could to save money. This led us to the idea that we were generally travelling one direction around the world – either west or east. The next step was to look at the weather. We knew that we would rather avoid the hottest time of year, the coldest/wettest time of year, and busiest tourist season in every location. Knowing we were leaving in July helped us get an idea of where we wanted to be and when. Many round the world books have collected average temperature and rain data about different locations.The website Price of Travel also has a lot of good information about climate and tourist season, both on its location profile pages and in posts about the best cheap places to travel during certain months. Once we read all this information, we were a little overwhelmed. Then Eric’s nerd side came out and he decided to try and organize it visually. 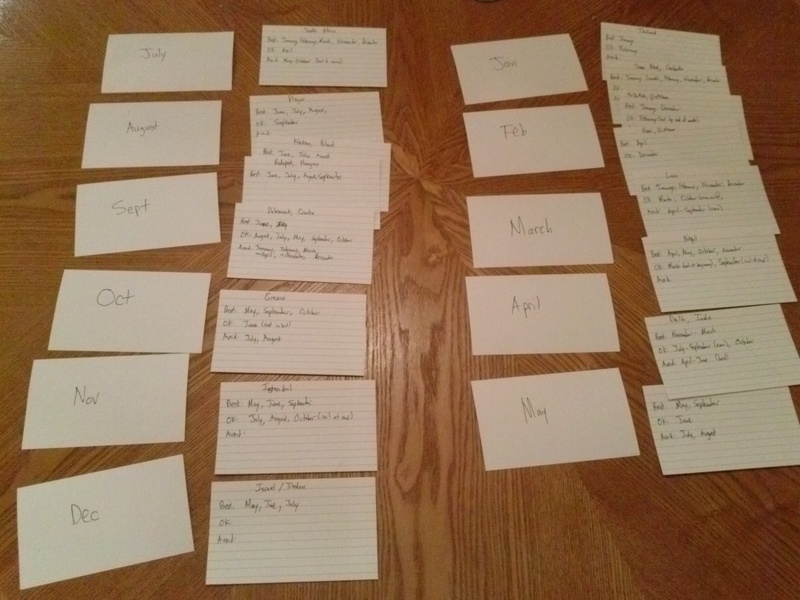 He decided to get some old-fashioned notecards and lay out an itinerary. First he made notecards for each month. Then, he made a notecard for each of the potential destinations and listed on the cards when it was best to visit the destination, when it was OK, and when to avoid. We then laid these cards out and tried to optimize for the “best” category. Using this system helped us come up with a general flow of the trip: Africa first, Europe next, and Asia last. We do get to Africa during the coldest part of the year, but it is the best time for wildlife watching. This also helps us avoid the worst of the summer crowds in Europe. Also, we will get to Asia during the best (least hot) weather months. We also looked at the relative cost of traveling in all locations we wanted to visit. We wanted to stick to a $100/day or less budget for the two of us. This, unfortunately, made us reconsider visiting many of the countries in Europe. However, the great news was once we decided that many of the countries in Western Europe were too expensive for this trip, it made us start to research more about countries that we knew very little about. Suddenly, countries like Slovakia, Slovenia, Croatia, Montenegro, and Albania were on our list. Finally, we had a general idea of the countries we wanted to visit and the order in which we could visit them. The next step was to learn more about each country in an effort to plan the approximate amount of time we might want to spend there. This became very tricky as we don’t want to over-plan the trip. This actually has been our biggest struggle in planning – attempting to plan too much! The beauty of a long trip is that we can shape the trip as we go. We can spend more time in places that we enjoy or less in places that we don’t. We will become exhausted if we are constantly on the move and should try to plan some down time in certain locales. Still, we want to do a little planning, so we decided to start with guide books. We are true believers in Lonely Planet guide books and have used many to guide our research. One thing that has been invaluable is the Denver Public Library. It offers loans on almost all Lonely Planet books that are quite recent. 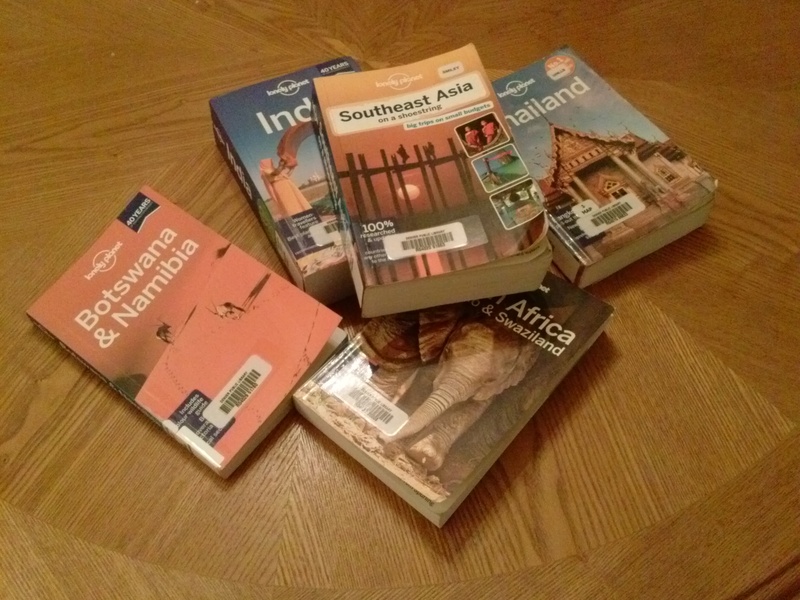 We have been able to get the guide books from the library and spend time reading through the various sites – giving us possible time tables and ideas about the best way to travel from one location to another. The guide books are a great resource for learning about a destination, but it’s also nice to hear more personal stories to really get a feel for the place. Luckily, on the Internet it is now very easy to find such stories! Often, if we want to read about a place, we will just Google “<place name> travel blog”, and a ton of results pop up. There are a few other web resources that we like to check. Wikitravel provides advice similar to a guidebook, so it’s a good place to use for cross-referencing. We also like to check Trip Advisor reviews to make sure that the places we are thinking of get good reviews. It’d be nice if we could remember all of this information we’ve found, but when you’re planning a whole year that’s somewhat hard to do! Our solution has been to keep track of what we have found in a set of Google Drive documents. This way, we can both edit them, and we will be able to access them from anywhere. Whenever we find a noteworthy link, we add it to the corresponding document for future reference. It’d be foolish to say that we have come up with our final plan. We are hoping that part of the fun of this adventure will be experiencing some unplanned and surprising things! So, we are hoping to use all this research as a basic guide but will continue to seek out new information about the places we are going to go. You can check out the Itinerary link on our to see where we’re currently planning to go… but don’t be surprised if you see it change! As Della well knows, when Wayne and I were planning our round the world trip, the key feature was travelling OVERLAND from Greece to India. Just a couple of weeks after we started our trip, we were in Italy and heard that hostages had been taken in Iran. This was 1979. Since our only choices were to go through Iran, or Afghanistan (which was at that time fighting off a Russian invasion), the whole premise of the trip had to be rethought. The bottom line is LIFE HAPPENS and when you are on a lengthy world trip, you can only plan so much…. Hi Della and Eric! This is fantastic! I love your strategies. How long have you been collecting points and awards on credit cards and such? Hey Jaime! I’d say we got into collecting points on a serious level before our Australia trip in 2012. Once we discovered we could get our Denver-Australia roundtrip for only $100 in fees we’ve been hooked! Hi Della and Eric! This is great stuff, love it! How long have you been saving/ scheming/ collecting points and awards on cards? Also, would love to hear about your technology decisions for the trip.